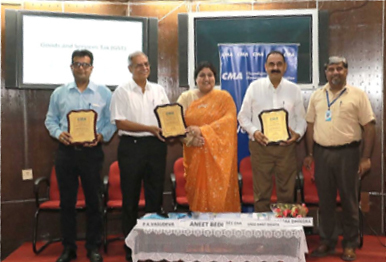 CMA organized a panel discussion on Goods and Services Tax (GST) on 23rd September 2016 in the auditorium of University Business School, Panjab University, Chandigarh. The panellists were Col. (Dr.) P K Vasudeva, Dr. Sanjeev Chadha, Professor Management Development Centre of MGSIPA, Punjab and Mr. U K Mehta, renowned Chartered Accountant. GST was all set to replace all indirect taxes on goods and services and to bring in much needed transparency and higher investments in the coming years. About 50 participants from all walks of life, such as professionals, academicians, industrialists and students of UBS, in addition to CMA members attended the programme.